In 2006, director Paul Greengrass proved that he was an artist capable of handling sensitive true-life material with United 93, the controversial first Hollywood movie of the 9/11 attacks. Through his shaky, vérité approach, Greengrass made the film feel as real as possible, almost like he was God himself ripping the top of that doomed plane off and peering inside at those passengers until the last crushing second. It was unbearably intense, emotional, and most of all, fearless. Seven years later, Greengrass delivers another scorcher with Captain Phillips, the true story about the 2009 attack on the Maersk Alabama by a small band of Somali pirates. 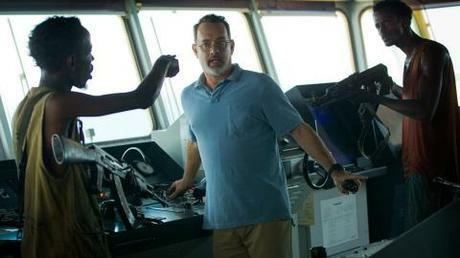 Retaining the fly-on-the-wall approach and tightening the intensity to point where you almost yell “uncle,” Captain Phillips in an arresting thriller with plenty of raw performances from a well-known veteran and a handful of scrappy new comers who jump at the chance to bear their fangs. The suspense is high when we’re on board of the Maersk Alabama, but Greengrass puts your nerves to the test when the action shifts from the narrow passages of the cargo freighter to the cramped conditions of a life boat. Captain Phillips introduces us to Captain Richard Phillips (played by Tom Hanks), who is preparing to sail the massive cargo freighter Maersk Alabama to Mombasa. After securing the ship and plotting a course with first mate Shane Murphy (played by Michael Chernus), the freighter sets out through waters plagued by pirate activity. Meanwhile in Somalia, two small groups of pirates are gearing up to take to the seas and attempt to highjack a ship. Leading one of these groups is Abduwali Muse (played by Barkhad Abdi), a skinny but determined pirate who handpicks Bilal (played by Barkhad Abdirahman), Elmi (played by Mahat M. Ali), and Najee (played by Faysal Ahmed) to accompany him on the mission. The Maersk Alabama’s voyage begins smooth enough, but soon, Phillips notices warnings about pirate activity in the waters that he is sailing. During a routine safety drill, Phillips notices two small skiffs approaching the freighter. With no weapons on board, Phillips alerts the UK Maritime Trade Operations, who advise him to arm the freighter’s firehouses in case these are indeed pirates. Due to the high waves of the freighter’s wake, the pirates are unable to catch up to the Maersk Alabama. The crew members of the freighter believe the threat is over, but the next day, the pirates return and are even more determined to get on board. Bringing the same heart-pounding suspense that he brought to all of his other previous projects, Greengrass kicks things off by allowing us intimate glimpses inside the lives of both Phillips and Muse. Phillips worries aloud to his wife, Andrea (played by Catherine Keener), about the future of their children. He expresses concern over them finding jobs in a world that has become increasingly cutthroat. Greengrass then hops over to Somalia, where Muse faces a group of mercenaries that demand that they highjack a ship for a warlord named Garaad. Villagers crowd the mercenaries for a chance to jump aboard the skiffs and assist in the taking of a grand vessel. Greengrass is showing us that there is competition and desperation everywhere, and in some places, you’re reduced to carrying out life threatening business to make money. From here, the tension slowly mounts as you count the seconds before the highjacking. A small blip on the radar screen causes you to squirm and your grip will tighten on the armrest when the pirates finally manage to latch a ladder onto the side of the freighter. When Muse and his men spill over the side of the boat, you may need a constant reminder to breathe as bullets fly, threats are made, tempers flare, and the crew of the Maersk Alabama quietly plot how to take back their ship without weapons. It’s exhilarating and exhausting just watching them. As Captain Phillips progresses to the confinement of that dreaded lifeboat, Greengrass proves once again that he is a master of keeping the action tight and engaging in a cramped space. Phillips tries everything to convince his captors that there is no way out of the situation they have gotten themselves into, but desperation prevails despite the fact that the Navy closing in on all sides. It’s inside this lifeboat that the performances from Hanks and Abdi burst into flames. Hanks is simultaneously cooperative and plotting against his captors. He tries a friendly approach while never letting his guard down for a second. While the testy Najee constantly argues that they should kill Phillips, Abdi’s Muse reveals a softer side. With Muse, it is simply business and he is playing the hand he has been dealt. Overall, while you may go in knowing the outcome of this extraordinary event, Captain Phillips excels in the finer details. Just how did those SEALS manage to fire off those incredible shots that ended the ordeal? What must it have been like to be stuffed inside the stifling lifeboat with an AK-47 stuck in your face? How did Phillips initially handle the situation when the Muse and his men stormed the bridge? It’s all there drenched in an unmatchable intensity and an unshakable realism that sends you away gasping for air. Bravo, Mr. Greengrass!